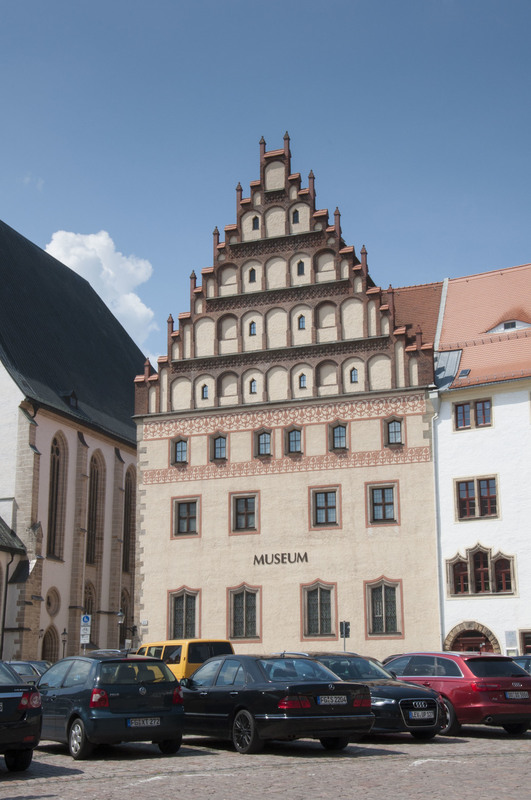 After the two Silbermanns in Rötha yesterday, we set off this morning for Freiberg to visit two more of Gottfried Silbermann’s organs. After a lovely 1.5 hour drive (the charming German countryside still hasn’t gotten old), we arrived at our destination and, with nearly two hours to go before our appointment, found a Greek restaurant in the center of town for lunch. Sitting outside in the sunny plaza, we were pleasantly surprised when our waitress brought out a complimentary round of ouzo! 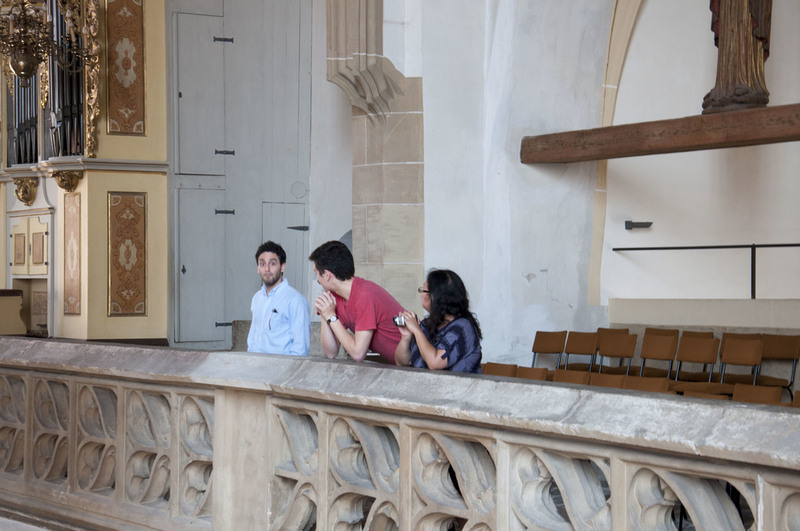 After finishing our meal, we walked over to the Freiberg cathedral to meet Clemens Lucke, our guide for the day. 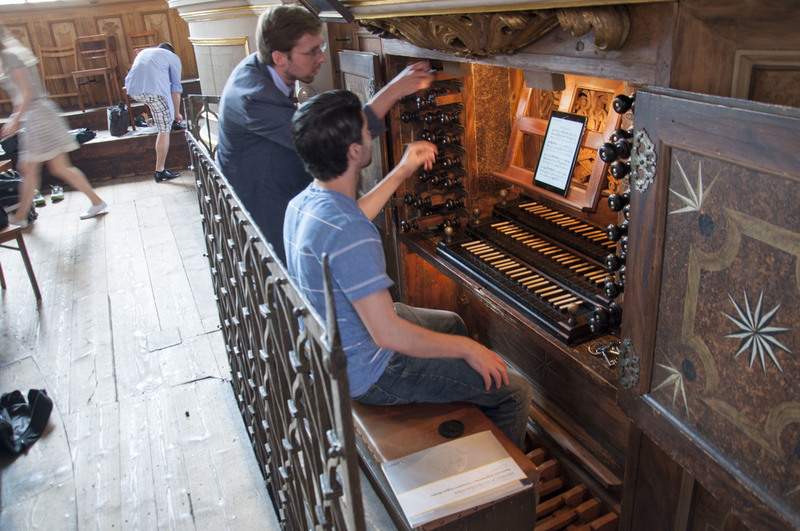 The three-manual, 44-stop organ in the cathedral was commissioned in 1711, when Gottfried Silbermann was only 28 years old, and completed three years later. 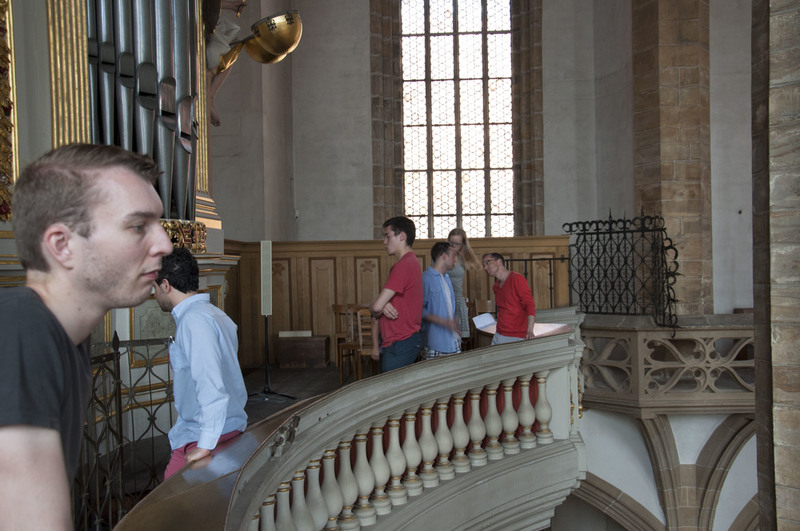 As each of us took turns playing (Bach, in most cases), the rest listened from a balcony facing the organ from the opposite end of the nave. That spot gave the sounds enough time and space to meld together and reach a perfect balance, in contrast to sitting at the organ console, where the pedal stops were disproportionately loud. Sitting on the balcony facing the organ, we were also able to admire the design of the church itself, from the splashes of color on the ceiling to the stunning chancel behind us. 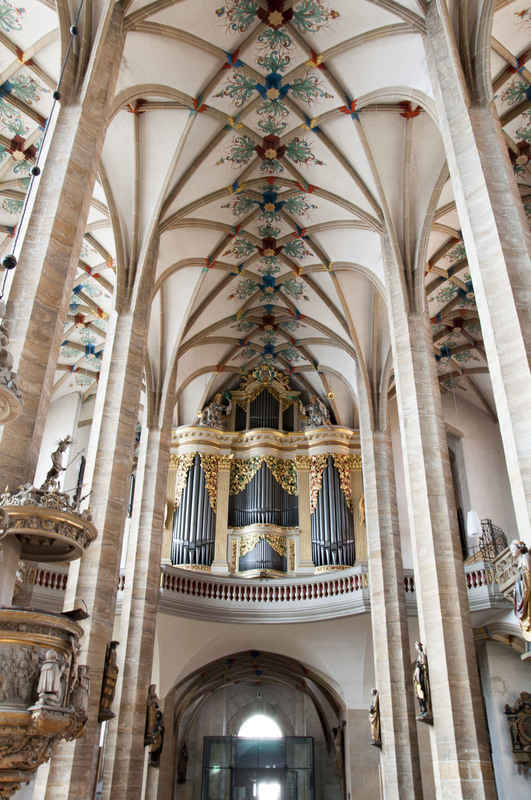 The second Silbermann organ, completed in 1735, was only a short walk away from the cathedral, in the Petrikirche. This organ is not as large as the previous one – two manuals and 32 stops – but lives in a smaller space and is thus capable of generating a powerful, fiery sound when all the stops are drawn, while still also being able to clearly enunciate with the softness of a single flute. Before leaving Freiberg, we had to make one more stop. 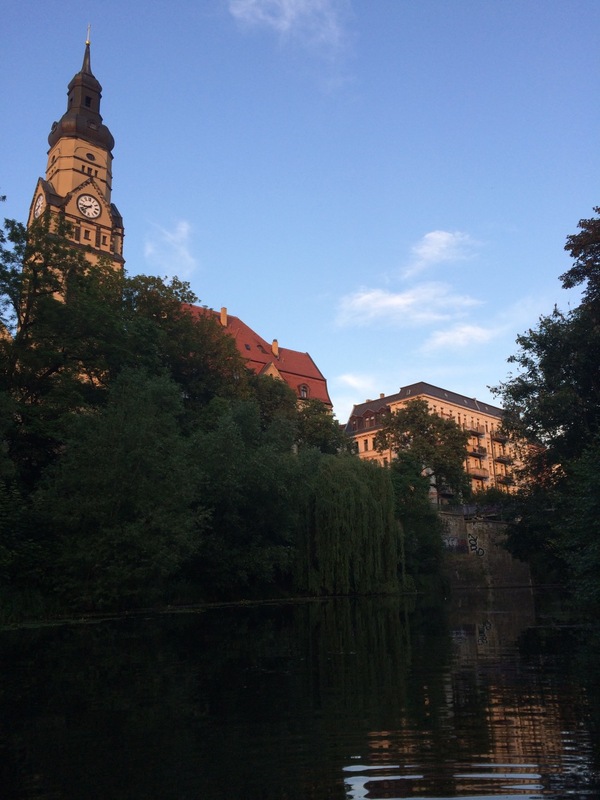 Yesterday, Martin recommended that while in Freiberg we try eierschecke, a town specialty. Not really knowing much about it, we asked Clemens where we might find this pastry. He pointed us in the direction of a cafe, and we set off. There, we each ordered a slice of eierschecke, which turned out to be a kind of sheet cake beneath a layer of sweet, eggy custard. As we left the cafe, Gianmarco suggested we pick up a sachertorte to serve as dessert that evening. The organ-playing part of the day was over unusually early – we made it back to our apartment by 6 o’clock – which gave us a nice chance to relax and enjoy our last evening in Leipzig. 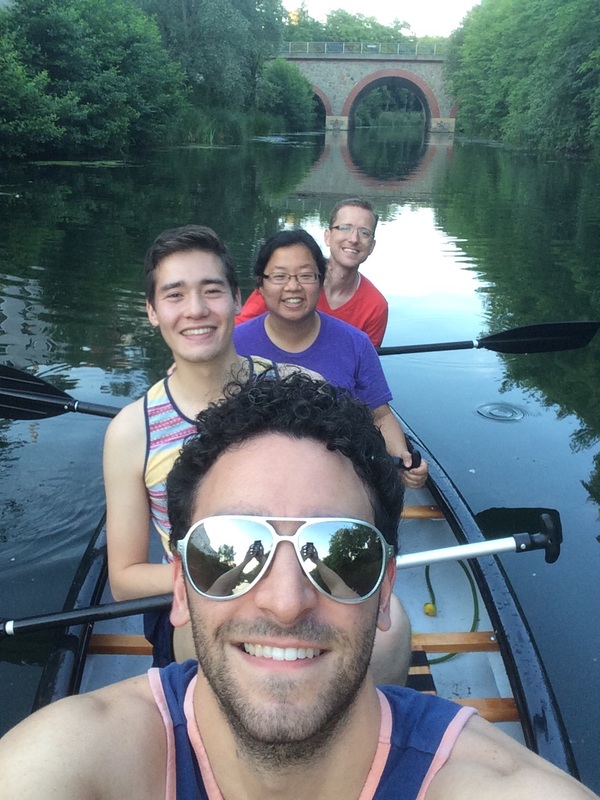 Jennifer, Gianmarco, Chris, and I went for a long canoe ride through the canals. Along the way we picked water lilies, tested the acoustics beneath bridges, and raced ducks and otters. The calm water and the warm evening sun turned these two peaceful hours into what we agreed was one of the most memorable experiences of the trip. Upon our return, Laura, Andreas, Kade, and David took over the canoe and went on their own journey through the canals, singing to themselves and serenading strangers on the shore. Meanwhile, the rest of us prepared our last dinner in this apartment: pasta with asparagus, tomatoes, and salmon, and the sachertorte for dessert. This evening was a wonderful way to end our time in Leipzig; tomorrow, we’re off to Norden!